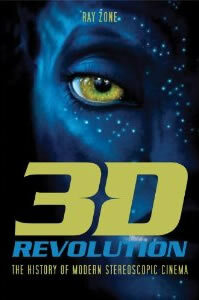 In 2009, Avatar, a 3-D movie directed by James Cameron, became the most successful motion picture of all time, a technological breakthrough that has grossed more than $2.5 billion worldwide. Its seamless computer-generated imagery and live action stereo photography effectively defined the importance of 3-D to the future of cinema, as well as all other currently evolving digital displays. Though stereoscopic cinema began in the early nineteenth century and exploded in the 1950s in Hollywood, its present status as an enduring genre was confirmed by Avatar’s success. 3-D Revolution: The History of Modern Stereoscopic Cinema traces the rise of modern 3-D technology from Arch Oboler’s Bwana Devil (1952), which launched the 50s 3-D boom in Hollywood, to the rapidly-modernizing 3-D industry today. Ray Zone takes a comprehensive approach that not only examines the technology of the films, but also investigates the business, culture, and art of their production. Influencing new generations of filmmakers for decades, the evolution of 3-D cinema technology continues to fill our theaters with summer blockbusters and holiday megahits.